Check out the latest Starstruck-related site: Galactic Girl Guides. 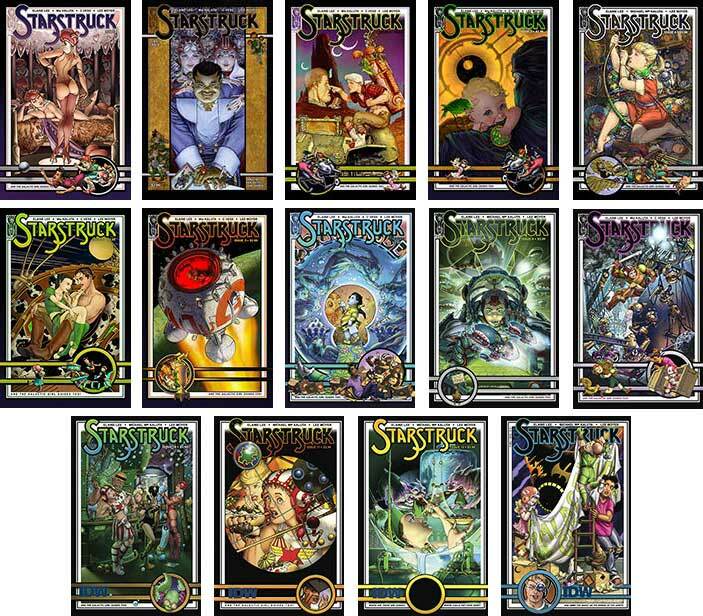 Visit Starstruck Comics Online to see interactive pages from the Starstruck Deluxe Edition. Available now: an audio recording of Starstruck. Visit Audio Comics Company for details. Here's a nice writeup about the history of Starstruck. Starstruck started coming out in August of 2009 from IDW. An issue came out every month for the next 12, making 13 monthly issues on the stands by September of 2010. Each issue contains a sizable Starstruck episode and a smaller helping of The Galactic Girl Guides back-up story, making approx 24 pages of comic art per issue. Add to that a set of text pages in each issue, mapping out some of the Starstruck world, in glossary, memoir and the ephemera of AnarchEra, all in the glorious new color provided by Lee Moyer. Here are the Covers, including an Incentive Cover for Starstruck Issue #1 (an incentive cover is a cover given to retailers who order a certain number of books... hence: rarer than the actual cover and offered to special customers by various store owners). If your local Comic Book Store hasn't got the issues, one can always purchase Starstruck at one of the online Comic Book Providers, like HeavyInk or many others that Google will provide if searched for. but the site's contents are accessible to all browsers. All content copyright © M.W. Kaluta unless otherwise noted.